In all my days this is about the most unique clock radio I've ever had! This Automatic was made in Boston and, is made of wood that I have redone! To add to its charm it has a dial light! Yep, can you believe it! 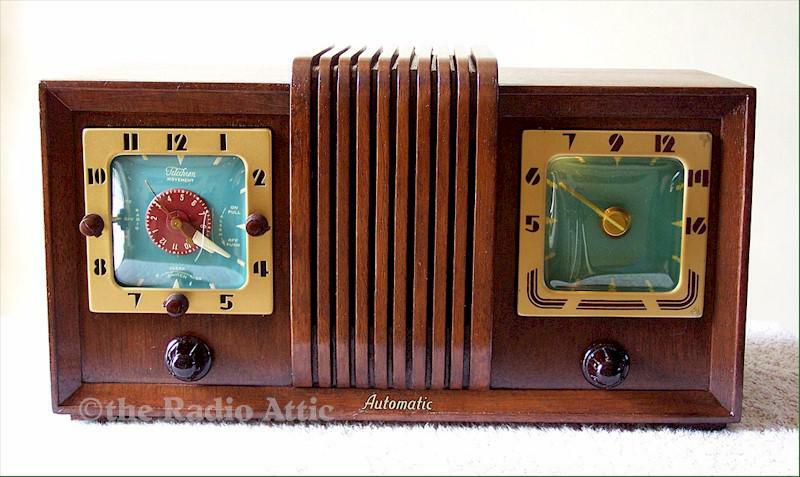 Not many clock radios back in the day had a dial light, but this one does! Electronically reconditioned and aligned with all new paper and electrolytic capacitors and all out of tolerance resistors replaced. A new power cord has been added! The clock, timer, alarm and added electrical appliance outlet in the back all function as they should! The five tubes are strong. A Jim Dennis Scale of Beauty "Dial Light Special!" If you'd like additional pictures please let me know. 13-1/4"W x 7"H x 5-3/4"D.
You are visitor number 2,361 to this page.